Eugene “Gene” Simonsmeier, 86, went to join the family of God on November 26, 2018. He had been surrounded with the love of his wife, daughters and family throughout his home hospice stay. Gene was born on August 5, 1932 to Ray and Althea (Sass) Simonsmeier in Plymouth, Wisconsin. He graduated from Plymouth High School in 1950 and joined the army in April of 1953. He served in the Field Artillery in Bamberg, Germany. While stationed there he used his leave time to travel throughout Europe. Gene was united in marriage to Tommie Ann Barrett of Garrison, Texas, in October of 1957. They were blessed with three daughters. Gene spent time supporting his daughters in Accents Color Guard and Girl Scout activities. He instilled his love of the outdoors by teaching them how to shoot, hunt, fish, and snowmobile – and drive fast. Tommie Ann passed away in 1973. Gene married Margaret (Peg) Pomeroy on July 29, 1977. Peg also had three daughters who were interwoven into the family. Gene worked for Simonsmeier Implement and then joined the Sheboygan County Sheriff’s Department in 1959. He worked as a patrolman until his promotion to Detective in 1968. He had different roles within the department until he retired in 1987. Upon Gene’s retirement from the Sheriff’s Department, he and Peg started a corporation, Lightening Express, utilizing his nickname “Lightening” which he earned as a young man as he loved to drive fast. This must have been a genetic skill because he passed it on to his daughters and grandchildren. He had a need for speed and a love for all things NASCAR and Green Bay Packers. 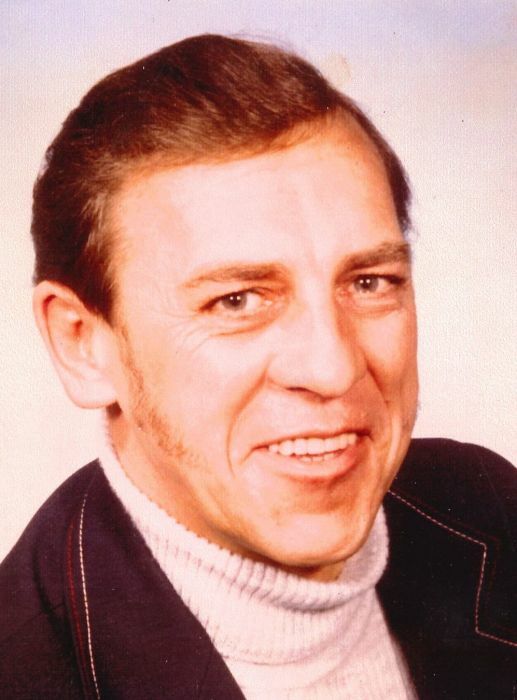 Gene is survived by his wife, Peg; three daughters: Vicki Simonsmeier of Logan, Utah, Patricia Simonsmeier of Sheboygan and Cindy (Michael) Cartwright of Fort Payne, Alabama; two stepdaughters: Jeri Gumtow of Sheboygan, and Samantha Simonsmeier (William) Allen of Junction City, Kansas; eleven grandchildren: Magen and Peyton Cartwright, Lauren Simonsmeier, Leondra, Dranika, Terrence, Demetri, and Geneva Allen, Daniel and Katie Champion and Derrick Zitzer; six great grandchildren, and two brothers: Robert of West Bend and Romaine of Marshfield. Gene was preceded in death by his first wife, Tommie Ann, his parents, stepdaughter Tina Champion, a sister and brother-in-law, Luella (John) Krupp and two sisters-in-law: Joyce, and Sharon Simonsmeier. A funeral service for Gene will be 1 PM, Saturday, December 1st at Wittkopp Funeral & Cremation Services with Rev. Casey Sugden officiating. Burial will be in Woodlawn Cemetery, Plymouth. Family and friends may gather at the funeral home, 123 South Street, Plymouth on Saturday from 11 AM until the time of service at 1 PM. Memorials in Gene’s name may be made to National Law Enforcement Officers Memorial Fund (http://www.lawmemorial.org/). The entire Simonsmeier family would like to offer special thanks to the staff of Sharon S. Richardson Community Hospice. It was Gene’s desire to remain at home and the staff support allowed our family to honor this last wish. Each person who entered the home came in with such respect and honor, and their friendly smiles made the hard days a bit brighter. For allowing us to honor his last wish, our family will be ever grateful.